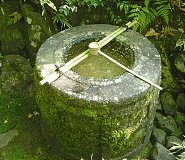 Garden design has been an important Japanese art for many centuries. 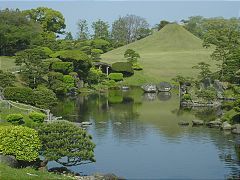 Traditional Japanese landscape gardens can be broadly categorized into three types, Tsukiyama Gardens (hill gardens), Karesansui Gardens (dry gardens) and Chaniwa Gardens (tea gardens). Ponds, streams, hills, stones, trees, flowers, bridges and paths are used to create a miniature reproduction of a natural scenery which is often a famous landscape in China or Japan. The name Tsukiyama refers to the creation of artificial hills. Tsukiyama gardens vary in size and in the way they are viewed. 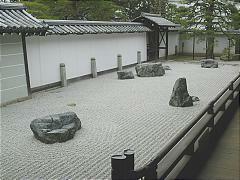 Smaller gardens are usually enjoyed from a single viewpoint, such as the veranda of a temple, while many larger gardens are best experienced by following a circular scrolling path. Karesansui gardens reproduce natural landscapes in a more abstract way by using stones, gravel, sand and sometimes a few patches of moss for representing mountains, islands, boats, seas and rivers. Karesansui gardens are strongly influenced by Zen Buddhism and used for meditation. Chaniwa gardens are built for the tea ceremony. They contain a tea house where the actual ceremony is held and are designed in aesthetic simplicity according to the concepts of sado (tea ceremony). Chaniwa gardens typically feature stepping stones that lead towards the tea house, stone lanterns and a stone basin (tsukubai), where guests purify themselves before participating in the ceremony.